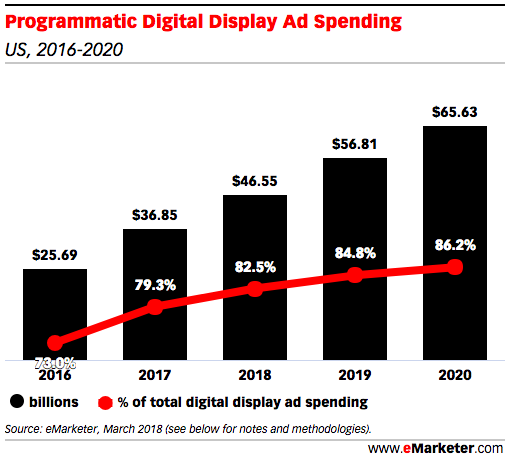 It accounts for 82.5% of total digital display ad spending right now and this number will only increase. So how did it all start? When digital advertising first came up in the early 1990s, everything was manual. It worked just like traditional media. Advertisers had to reach out to each publisher and negotiate. It meant so many emails back and forth before a deal was closed. Moreover, ad impressions were bought in bulk, which meant a lot of initial spend before testing the waters. While this model was okay in the beginning, as more publishers and advertisers came into the picture, things became tedious. Advertisers had to reach out to hundreds and thousands of publishers, and they had the difficult task of finding the best deal among all these advertisers. Then came ad servers in 1995, which made it possible for both publishers and advertisers to manage thousands of ad creatives in one place. Ad networks were also born soon in 1998, which bundled many publishers together. This meant advertisers could stop contacting each publisher individually. All they had to do was contact one ad network. More than a decade later in 2009, programmatic advertising was born – revolutionizing the whole digital advertising industry. Additional Read: Programmatic advertising vs Google Display Network: Which one should you choose? Programmatic advertising is an automated process of buying ad space in real-time with the help of data. It makes the whole process much more fast, efficient, relevant, and targeted. Programmatic advertising is, in fact, an umbrella term for many different ways to buy media using digital technology and data. Before we move on to the details of each, it’s important you understand why many advertisers prefer it. Targeting: Thanks to the huge amount of data available, advertisers can laser target the audience they want. Performance: The ROI is great because you have a program working for you that learns on the run. Insights: Ultra-specific targeting and having a program that learns as it goes, allows you to get better insights on all your campaigns. Inventory quality: When it comes to Programmatic Direct, the quality of inventory is also way better. Before we move onto different types of programmatic advertising, it’s important to understand a few terminologies. Knowing what these terms mean will go a long way in unravelling the complex world of programmatic advertising. Ad Inventory: It is the total amount of advertising space made available by publishers for advertisers for a given period of time. Ad Exchange: It’s a platform where ad inventory is sold. Ad Server: It is the host-like technology that actually shows the ads in a website. Browser Cookie: Browser Cookies are data that’s stored in your web browser based on your surfing history. It helps advertisers show relevant ads to site visitors. Ad impression: One ad impression is equal to the ad showing up for one user. It doesn’t mean that the user clicked on it. CPM (Cost per Mille): Mille is the Latin word for “thousand.” CPM refers to the cost of 1000 ad impressions on a webpage. DMP (Data Management Platform): DMP is like a warehouse where huge chunks of user data is collected, organized, and stored. It helps publishers, agencies, and brands to make the ads more effective. DSP (Demand-Side Platform): DSP is a technology used by advertisers to automate ad buying. MediaMath, Invite Media and DataXU are a few of the top DSPs. SSP (Supply-Side Platform): SSP is a technology used by publishers to automate ad selling. OpenX, Google, Right Media and PubMatic are the top SSPs. Now that you know the basic concepts, let us look into the different types of programmatic advertising. There are mainly three types of programmatic advertising. Which one you should go for depends on your preferences. For example, RTBs are perfect for first timers testing the waters while programmatic direct is for more experienced advertisers who know what’s best for their brand. Also PMPs can be a budget-friendly way to get premium ad space. RTB is an auction-based model that happens in milliseconds. $19.55 billion were spent on RTBs in the US alone. It accounts for 42% of all programmatic display ads. Publisher updates the availability of ad inventory to ad exchanges via their SSP. Advertisers decide the audience they want to target. This is based on all the data they have like interests, demographics, and many more. A visitor enters a website. While the page is loading, the user’s information and page content are reported to ad exchanges via cookies. If website information matches an advertiser’s specifications, the advertiser enters the auction for real time bidding. Many similar advertisers enter the same auction. The advertiser with the highest bid wins the ad space and his ad is shown on the webpage. The publisher gets paid for that impression. The whole process from bullets 2-6 is automated and happens within the fraction of a second. Per-Impression Buying: RTB allows advertisers to buy impressions individually instead of agreeing to buy them in bulk for a predetermined price. This is much more cost effective. Easy to test: As impression level data is obtained, advertisers can analyze effectiveness of a particular ad creative for a target audience. This helps advertisers to be more agile. Remaining ad space gets sold: As RTB auctions happen automatically when a visitor enters a particular page, unsold inventory which was previously unwanted also gets sold. If you are looking for the most cost-effective way to get into programmatic advertising, RTB is the way to go. It is a great way to do a lot of testing and see what’s working. A private marketplace is basically an RTB auction that allows only a selected number of advertisers to take part in. It is more like an invite-only method offered by big publications like Forbes where the ad costs are in the premium range. There are no middlemen like SSPs and ad exchanges in this case. In the US alone, $8.99 billion worth of ads were run on PMPs. Over 45% of all ad auctions are done via private marketing places. Transparency: This is the greatest advantage offered by PMPs. Advertisers get to know the kind of ad inventory they are buying and the publisher gets to know the type of creatives their visitors are seeing. Preferential access: PMPs are usually done before RTBs. This means that advertisers get early access and preference over the public. Premium rates: Publishers can make much more money via PMPs than RTBs. If you are looking for premium access at lesser rates, PMPs are a great place to start. It’s much more cost effective than programmatic direct. Programmatic direct ads are sold manually. Here, specific ad inventories are bought based on a fixed CPM. Negotiations may or may not happen depending on the publisher and advertiser involved. Once ad space is bought, the rest of the process works programmatically. 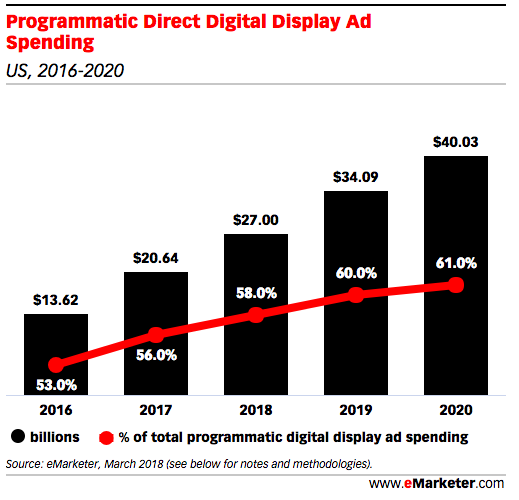 It is set to account for 61% of all programmatic display advertising by 2020. More control: Both publishers and advertisers can be certain of the number of inventories bought and sold. Advanced Insights: Publishers will be able to give deeper insights in regards to audience behavior. This makes it easier for advertisers to gauge the value of their campaigns. If you’re focused completely on premium placements, then brand safety programmatic direct is perfect for you. However, you also need a big ad budget as this is the most expensive choice among the three. If you are new to the world of programmatic advertising, the following tips are a must-read before you start your first campaign. If you have some experience, you can just skim through the headers and jump into the case studies at the end. Lead Acquisition: No matter what your business is, its success depends on your ability to get more people to try your product or service. With programmatic advertising, you can hyper-target people who fall into your customer persona. Lead Nurturing: Existing leads need to be nurtured multiple times before they actually convert. Thanks to cookies, retargeting is one of the most popular ways to convert leads into paid customers using programmatic advertising. Customer Loyalty: Most people think that marketing ends once someone buys your product or service. This is far from the truth. Programmatic advertising can be used to maintain the relationship, improve chances of upselling, and even of your customers recommending your product or service to their friends or colleagues. You have to first analyze your funnel and see where you have too much churn. Use programmatic advertising in that stage to give it a little bit of a boost. If you have the budget, you can even use programmatic advertising in all stages of the funnel. Native Advertising: These are ads that blend into the editorial content of a website. They are super effective as long as the page you lead them to doesn’t turn out to be irrelevant. Display Advertising: These are ads that do not look like the editorial content of the website. They stand out as ads and are placed in specific areas outside the editorial space. The best way to choose between the two is by observing what’s working in your industry. You can use our free competitive analysis tool to get an in-depth analysis of your competitor’s ad strategies. You can check out everything from the kind of ads they are running to the publishers they are targeting and much more. 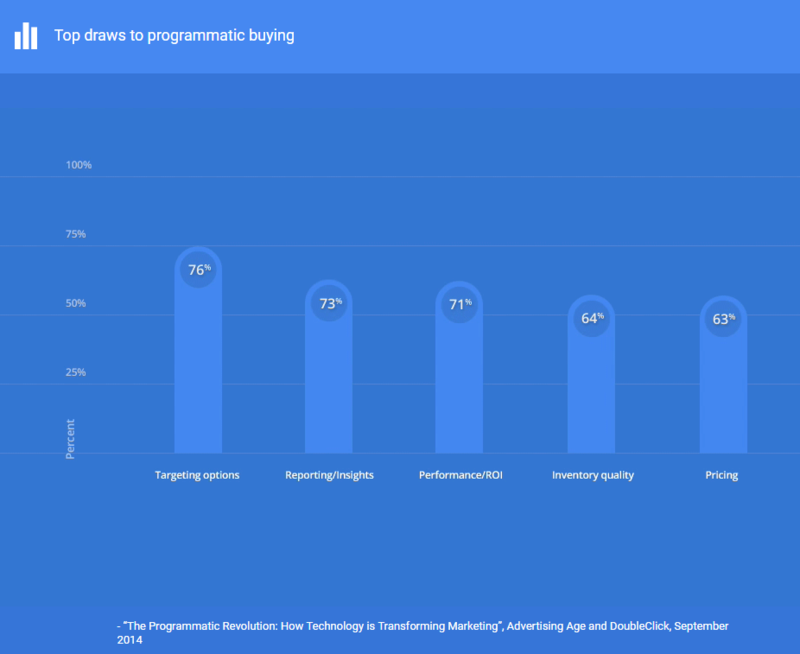 Many times, choosing the right programmatic ad platform can be as important as targeting. If you get the first step wrong, everything that follows is bound to be less successful. But then, there are many platforms out there and it can be hard to decide which one is the most suitable for you. To start with, you can check out our mini guide on how to choose the right programmatic ad platform. Programmatic advertising is not simple. It’s complicated and there’s money involved. Most companies do not risk it by doing things themselves and hire expert agencies instead to do the job for them. While only 16% of companies went for an in-house team before 2018, this number is changing quickly. However, in an Adweek survey, we got to know that as much as 86% of advertisers are planning to take the in-house route. Almost 75% of respondents felt that agencies are not transparent when it comes to reporting financial data, and 73% felt that agencies are not equipped to measure programmatic results accurately. So, should you go for an in-house team or an agency? A mix of both would be the best choice. Building an in-house team with all the expertise can be a challenge. The best thing to do is work with what you have and fill in the gaps with the help of agencies. For example, if you have a team with good analytical skills experienced in data management, hire an agency to do the optimization and vice versa. The best way to learn is by looking into the practical experiences of other advertisers. We’ve done tons of industry roundups and case studies so that you don’t have to learn a lot of things the hard way. How Answers.com makes millions in revenue using native ads: This case study looks into the complete native advertising funnel of Answers.com. You can use many of their hacks and tweak it a little bit to suit your own industry. An Uncensored Peek Inside Grammarly’s $2.2M Display Strategy: Grammarly’s growth story is linked to their really good display strategy. This post is a sneak peek into their ad networks, publishers, ad creatives, and even landing pages! All the data used in the above case studies were taken from our competitive analysis tool. Feel free to check it out to know your own competitor’s ad strategy.